I went to the wall looking for the ancient world that made this claim, and to explore the masterpiece that represents one of the greatest civilizations of antiquity and one of the greatest of all human achievements. Although I encountered more tourists than heroes during my trip, the experience showed me why the Great Wall is often considered the grandest of all human creations. There are several locations in the countryside north of Beijing where you can climb up for a view of the 2000-year-old wall that snakes its way up and down the mountain peaks and over the hills. The Wall stretches 5000 kilometers across northern China from the east coast of the Bohai Sea, ending in the isolated Western Gobi Desert. The first sections of the wall were built during the Qin Dynasty in the third century BCE by order of China’s first emperor Qin Shihuang. Over the centuries separate walls, built by China’s once independent warring states, were joined together in an effort to keep out the Mongol invaders from the north. Although the wall wasn’t always successful in keeping the attackers out (tower guards could be easily bribed), the structure did serve well as an elevated highway that could transport China’s armies across otherwise impassable mountain landscape. 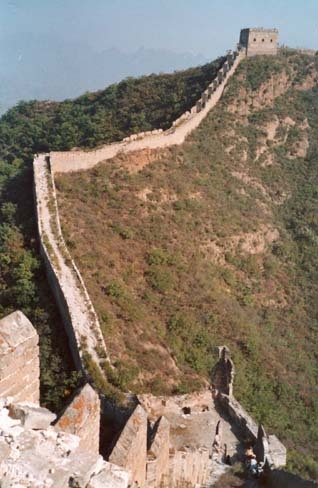 During the Ming Dynasty (1368-1644) the entire Wall was refaced with bricks and stone slabs, a process which took over 100 years, costing the lives of many thousands of slaves who were literally worked to death. In the centuries that followed, the wall was largely forgotten, left to deteriorate, and many sections returned to dust, only to be rescued in recent years as a result of the tourist industry for which it became a prime site. Many important sections have been rebuilt, some overrun by souvenir stands, restaurants, and even amusement park rides. There are fortunately also sections of the wall where you can escape the crowds and experience it in all its authenticity and unspoiled, awe-inspiring natural setting. My preliminary reading on all the different sections of the Wall that could be visited told me that one section, Badaling, offered a new age theme park with interactive films, cable cars running along the wall, and legions of tourists with their families. This section had been completely renovated for easy access, and although the views remain stunning, it was definitely not what I was looking for. There are also parts of the Wall that crowds generally avoid because of the often dangerous steep climbs, crumbling unrestored surfaces, and disintegration to such a degree that you may find yourself walking on pebbles and dust rather than a wall. I wanted to be as close to the real thing as possible as well as having a challenge, regardless of the danger it might entail; but I also wanted as long a section as possible, to spend most of the day hiking. The section from Jinshanling to Simatai fit my criteria perfectly. Jinshanling is less developed in terms of modern renovations than other sections, providing a more authentic experience. It’s not as steep as other sections of the Wall; however, it does mark the beginning of a 10-kilometre hike to Simatai, which is among the steepest, and therefore most exhilarating sections. 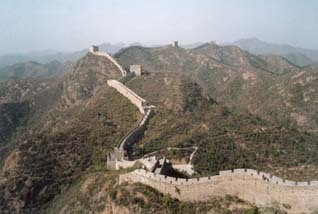 Our hostel in Beijing offered a return bus-trip from our front door to Jinshanling — 100 kilometres from Beijing — for about 11 dollars Canadian, not including the six dollars admission to climb the Wall. With the chaotic traffic trying to get across and out of Beijing, the trip took us four hours. We travelled far out into the countryside, and quickly lost sight of any major cities or towns. The bus dropped us off at a solitary gate and we were informed we would be picked up at the other end later in the afternoon. Setting out quickly and following a paved trail up into the hills, we lost the others in our group. I soon noticed a section of the wall above me running along the top of a ridge. The hill however was too steep above the valley trail so that I could not see beyond the Wall. It was only when I climbed the steps of the first tower did I realize that I had entered a world of centuries past. Reaching the top of the stairs I turned to look behind me, and an ancient world previously far from me both in time, culture, and geography opened up before my eyes. I saw a background of mountains rising and falling in all different shades of green under a pale cloudless sky. The sky was almost peripheral to the scene as was the vegetation. For once — a very rare experience for me — the textures of nature paled in comparison to what I saw built by human hands, so long ago and over such a long period of time. This was no natural wonder, it was a wonder of human creation. Against the background of mountains and across the spine of China as far as I could see, a golden-brown wall twisted and turned along the ridge in undulating formations, supported by towers at critical high points beyond which the wall dropped off again. The Wall harmonized with the rolls and turns of the hills and mountains, as if a majestic and mythical scaled serpent were lying at ease across the endless landscape. I have stood wide-eyed before mountain views before — in Canada, America, Europe and Morocco — but I have never dared to cross them on foot, nor even considered the possibility. 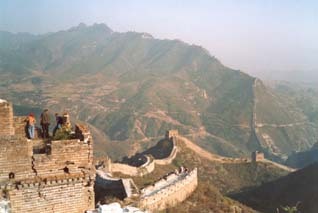 The Great Wall, however, is a tempting invitation offering a real passage over the mountains and into the far-off horizon. Standing there I could not only imagine but truly comprehend how the Wall gives access to the farthest reaches of this land — and of the mind. In the past and faced with such a geographic expanse, I would only have felt overwhelmed. Here I felt awed but strangely empowered. 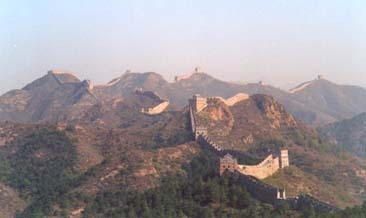 The Great Wall of China began as a barrier to separate civilizations; an impediment to invaders. Today the Wall is a path into history, from ancient to present. It also now represents how civilizations have traversed similar historic paths; built similar but less extensive walls, for similar reasons. Other walls have been built to keep people out, or other people in. And many of these walls have eventually fallen and disappeared. On the rising and falling path of human history, we have often left walls — monuments built with human hands using the the resources of nature. Our walls have marked where we have gone and where we have disallowed others to go. In one sense, the Great Wall is a bridge into nowhere; but it is also a passage in a greater sense. The constant and ongoing journey that is literally and metaphorically embedded in the Wall is the real passage; and as you marvel at its timelessness and enormous scale, you realize that you have already reached an important goal. You are witnessing the transcendence of time. After the tourists have come and gone and the days and nights of human time have blended into each other in the clouds of centuries past, I am sure that the Wall will remain. It is, above all, a symbol of an ancient civilization daring to build a path to the horizon, to span the magnitude of time and nature.